This charming two bedroom detached villa is situated on a corner plot in a quiet residential area of the traditional village of Tremithousa. Local village amenities are within easy walking distance and Paphos Town and the beautiful coastline are only a few minutes drive away. The ground floor accommodation features an open plan living room including cosy lounge and formal dining area, both with sliding patio doors providing easy access to a spacious covered outdoor terrace. A fully fitted corner kitchen with fresh white units is nicely separated from the living area by a useful breakfast bar and a guest WC is situated to the side of the marble staircase leading up to the first floor. Upstairs are two double size bedrooms, each with fitted wardrobes and direct access to a shared terrace featuring stunning rural and coastal views. A modern bathroom with stylish vanity unit and useful store cupboard is accessed directly from the hallway, where there is a further built-in linen cupboard and housing for the washing machine. The outdoor leisure space is designed with low maintenance in mind and in addition to the full width covered veranda which enjoys beautiful countryside views, there is a side patio with kleftiko oven and BBQ space. Near the entrance to the property is a level driveway with parking space for two cars and a shed provides useful external storage space. 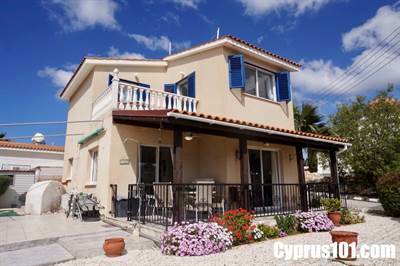 This property is certainly a perfect option for those wishing to live permanently or enjoy a holiday home in a peaceful village location, within walking distance to a taverna and only minutes away from Paphos Town. A selection of furniture can be included if required and there are full title deeds.